Myths and legendsIn addition to illustrating people and places, the map also shows supernatural scenes from classical Greek and Roman mythology, Biblical tales and a collection of popular legends and stories. Look near the Strait of Gibraltar and you’ll see the Columns of Hercules, which were thought to mark the end of the inhabited world. The earthly paradise of Eden is represented by a circular island at the eastern extreme of the world, near Asia. From Greek mythology, the Cretan labyrinth built by Daedalus to contain the Minotaur is shown, as is the myth of Jason and the Golden Fleece. 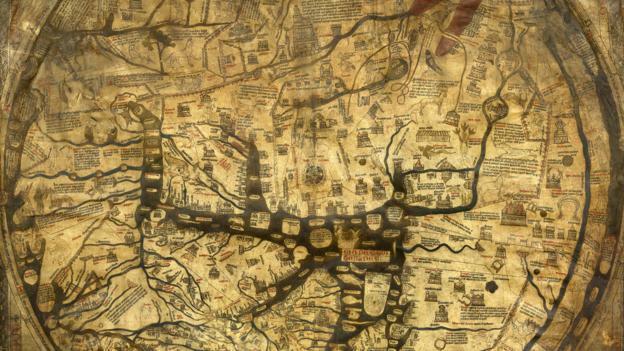 Historian and cathedral librarian Rosemary Firman believes that the map was intended to be seen by pilgrims visiting the shrine of St Thomas Cantilupe, who was buried at Hereford Cathedral.